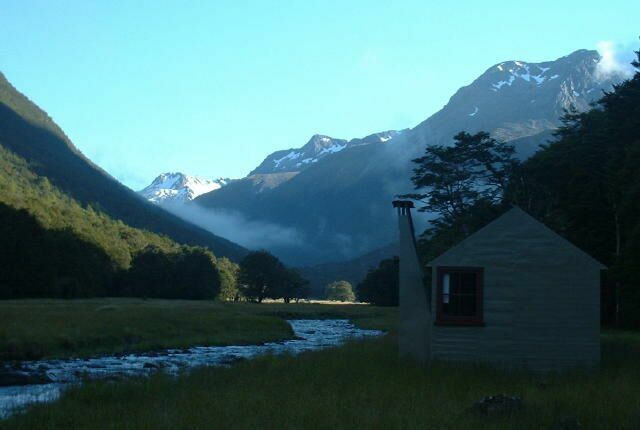 This trip is the one described in the book "Classic Tramping in New Zealand" by Shaun Barnett and Rob Brown. 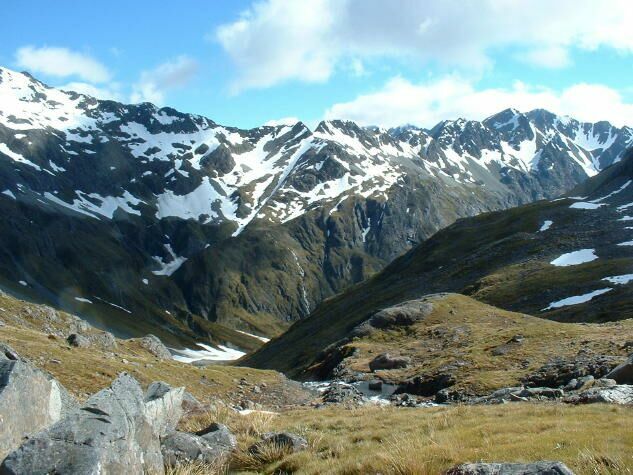 A slightly shorter variant, which goes from Blue Lake to the Matakitaki via Moss Pass and David Saddle rather than via Waiau, Thompson and Upper D'Urville passes is described by Sven Brabyn in "Tramping in the South Island: Mt Richmond Forest Park to Arthur's Pass". The trip takes 6 to 9 days. I took 6 (from 9th to 13th January 2005) but had to put in several long days (10 - 12 hours). 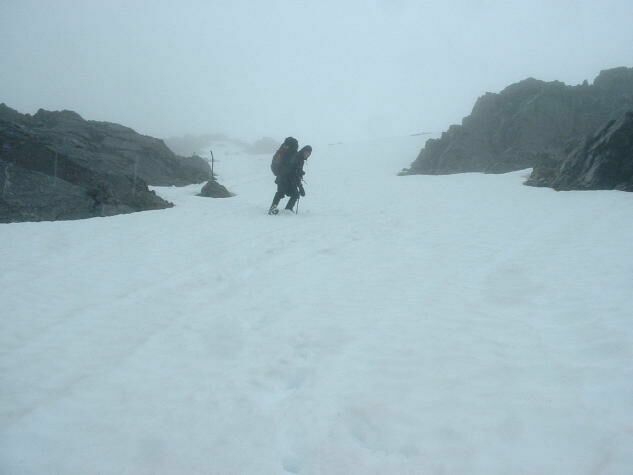 Some sections of the route are untracked and unmarked (not even any cairns), and cross high alpine passes: navigational skills and some alpine experience are necessary. I took a bus (Laserline) from Christchurch to Kawatiri Junction, where I was picked up by Nelson Lakes Shuttles, who took me to St Arnaud. Then I optimistically waited around for some time at Lake Rotoiti hoping that someone else would want to share the cost of a trip to the lake head, but eventually gave up and paid the full cost myself. A bit more advance planning (phoning the water taxi guy first) would have saved me an hour and $30 or so, since a party had just left when I arrived and if he'd known I was coming he'd have waited for me. When I came out at Lewis Pass I walked down to Maruia Springs and had to spend nearly a whole day there before getting the bus back to Christchurch. Again with the benefit of hindsight a better scheme might have been to have driven my car from Christchurch to somewhere in the vicinity of Lewis Pass (possibly even Maruia Springs itself) and got the bus from there to Kawatiri Junction. Then when I came out I could have driven straight back to Christchurch, saving myself a whole day. Day 1: Rotoiti Lake Head to John Tait Hut. Since I didn't get away from the head of Lake Rotoiti until 4:30pm, this was a short day. 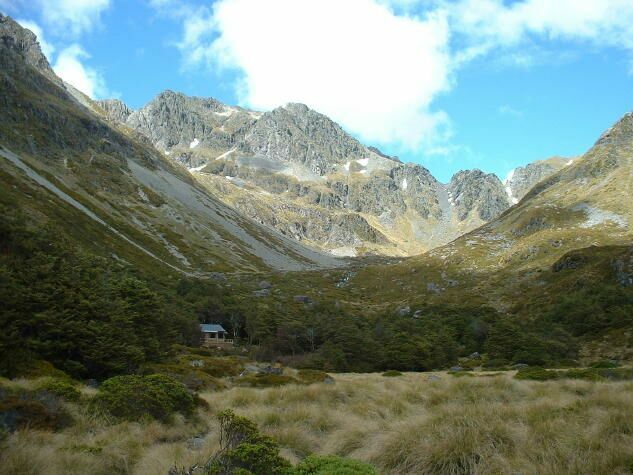 I only had time to walk up the Travers River to John Tait Hut (4.5 hours). It's pleasant easy travel on a well-formed track with bridges over all the side-streams. There's plenty of nice beech forest and a few lovely river valley scenes, but nothing terribly dramatic. I'd advise anyone else doing this trip to get away a few hours earlier and press on to the Upper Travers Hut, which is 2.5 hours further on. Apart from being a more spectacular place to stay, it would make the next day a lot easier! Day 2. The first leg on day 2 was a pleasant 2.5 hour amble up to Upper Travers Hut, beautifully sited near the head of the Travers River. From there another hour and a half gets you to Travers Saddle, which is out of sight around to the right in the photo. It's a steepish but straightforward climb with some good views along the way, although the views at the pass itself are a somewhat restricted. 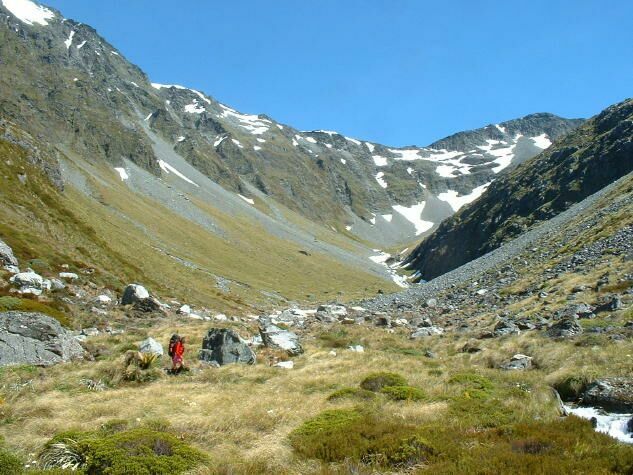 From the Traverse Saddle it's a knee-rattling 1000m drop down into the deeply incised East branch of the Sabine. A descent of a long scree ridge on a light unpoled ground trail had me scratching my head and reaching for my map; I was expecting a more tourist-grade route! Further down, the track crosses a bleak avalanche-damaged area where a large section of forest appears to have been swept aside by a giant hand. 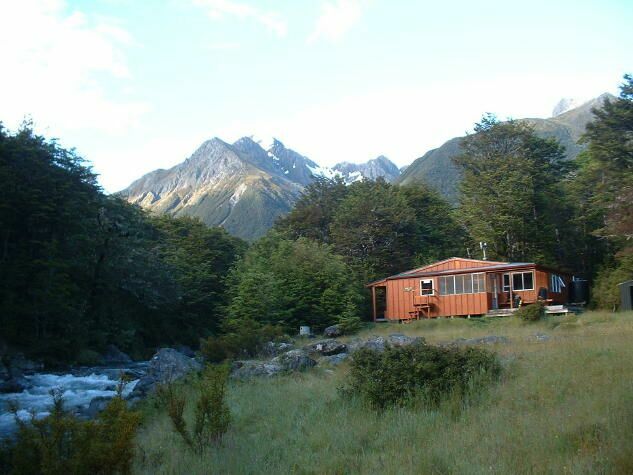 Once you're in the bush itself, however, it's easy tramping through lush beech forest. As can be seen in the previous photo, the East Sabine is deeply incised, but just how deeply I had no idea until I came to this bridge, where the track crosses to the true left. Here the E Sabine, a significant river by this stage, roars through an incredibly deep narrow slot, surely at least 30m down and only a couple of metres wide. This has to be seen to be believed! I arrived at West Sabine Hut, near the Sabine Forks, some 9 hours after leaving John Tait (including lunch and breaks). There I had a cup of soup and decided to amble on towards Blue Lake Hut, hoping to find a nice campsite en route. But it was not to be. Light drizzle which started as I left the hut soon turned into steady rain and then a major thunderstorm. Camping seemed less and less attractive, so I decided to push on to Blue Lake hut. That wasn't to be, either! At the point where the track climbs more steeply to the Blue Lake basin I found a huge icefield of avalanche debris that had obliterated several hundred metres of track. With dwindling light and even more-dwindling energy levels this proved too much for me! So I set up camp on the track in the bush just below the avalanche zone. Day 3. 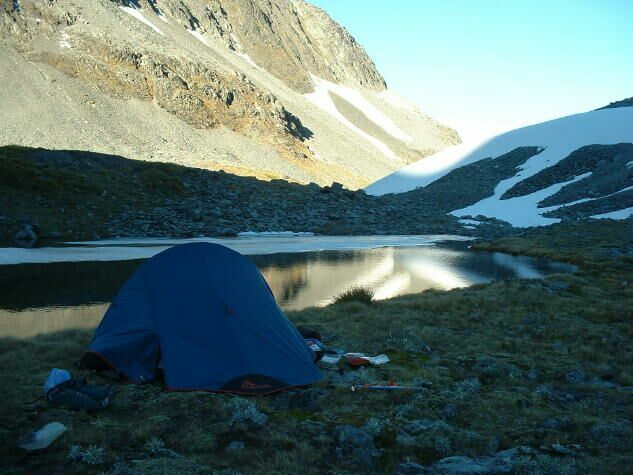 With more light, a good night's sleep and no rain the icefield didn't look too bad after all. 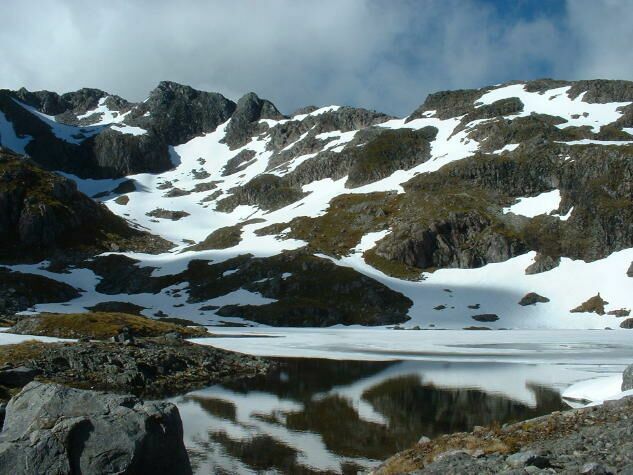 A bit of scrambling and bush bashing got me on to the ice, and it was then an easy half hour's womble up to Blue Lake hut. 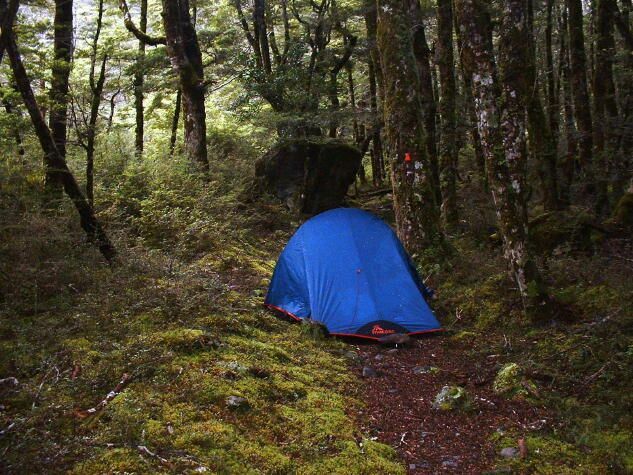 There I ran into Rebekah Wright, a 21 year old on about day 14 of a 40 day marathon solo tramp that would eventually take her from Nelson down to Arthurs Pass and beyond. And I thought I was being adventurous! Damn! She too was heading towards Lewis Pass, but via the less-challenging Waiau River route. She liked the sound of my route more, so we teamed up and carried on together. The photo shows Blue Lake as we climbed towards Lake Constance. The track climbs high to the west of Lake Constance to cross bluffs and then drops down to lake level, where we were amused to see a line of poles, complete with orange triangles, crossing the lake ten metres of more from the edge. 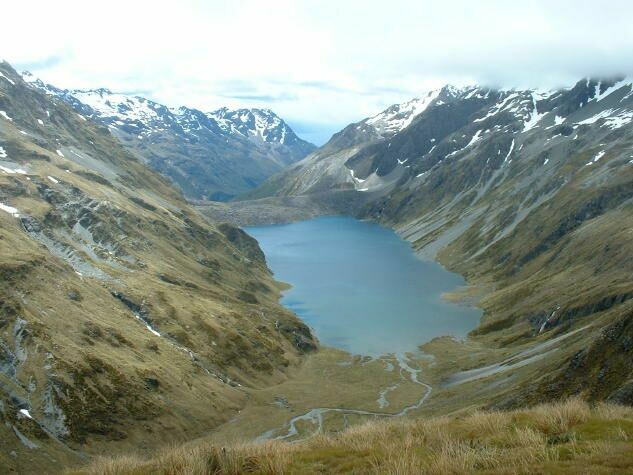 From the head of the lake, the track then starts the steep ascent to Waiau Pass. The photo shows the view down into Lake Constance from half way up. The weather was starting to deteriorate as we crossed the Waiau Pass. My ice axe and walking pole, shared between the two of us, came in handy here and in the later alpine passes too. Navigation down from the pass to the Waiau River needed a little bit of caution in the intermittent murk, but we soon made it down. 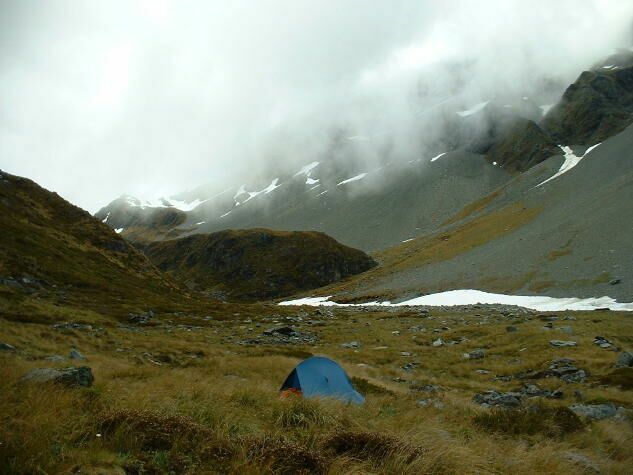 We had been intending to continue an hour or so on up the Waiau to Lake Thompson, but that seemed less appealing in the heavy rain and descending clag, so we set up camp in tussock near where the track from Waiau Pass meets the Waiau. Day 4. Next morning the good weather appeared at last and we headed on up to Lake Thompson. It's an idyllic spot and we cursed the fact that we'd decided to camp down below in the lumpy tussock, though admittedly Lake Thompson would have been a bleak and murky place the previous evening. 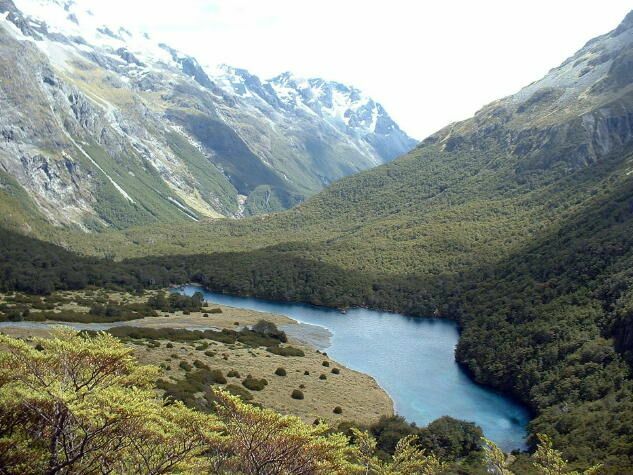 The photo shows the view from Lake Thomson towards the Waiau Pass, which is the V notch in the centre skyline. In this view the final drop down to the valley looks horrendous but it was actually perfectly straightforward. From Thompson Pass there's a long sidle to the so-called "Upper D'Urville Pass" (unnamed on the map). This photo shows the view back towards Thompson Pass from the Upper D'Urville Pass. Our route, shown in red, was all straightforward except for a brief unpleasantly-gnarly bit on steep wet snowgrass near the start. Looking back from here, it seems like a much better route, shown in yellow, would be to follow up the ridge for a bit before dropping into the basin. Maybe that's what Barnett and Brown meant when they said "traverse the ridge running south-east..."?! If anyone tries the yellow route, please let me know how it goes. Just don't sue if you kill yourself, that's all I ask! Our long day from the Waiau continued as we descended from the Upper D'Urville pass into the East Matakitaki and carried on downstream to the East Matakitaki hut, a welcome sight at the end of a 12-hour day. 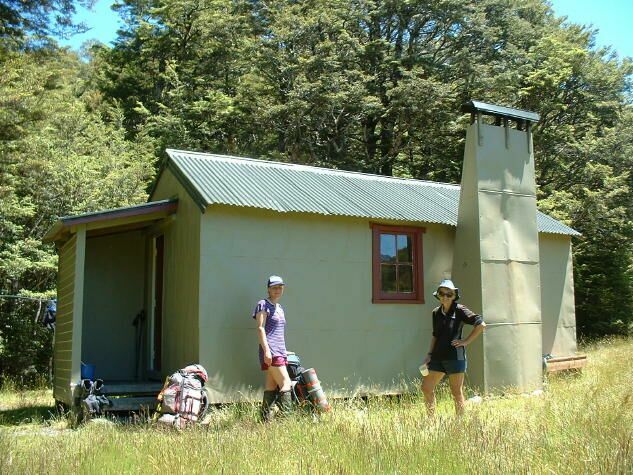 Actually, it would be a welcome sight just about any time -- it's old NZFS hut that has been declared an historic place and nicely cleaned up and painted inside. A lovely place to spend the night. Thanks, DOC! This photo was taken the next morning. Day 5. The following day, still in glorious weather, we continued down the E Matakitaki to the forks and then up the West Matakitaki to another lovely old hut called Bob's Hut. Here we met a tough old bird (is it OK for an old guy like me to call her that?) who had fallen in snowgrass the previous day while descending from 3-tarns pass. She had cracked a couple of ribs and was no longer able to carry a pack, use her upper body, or even breathe heavily! But rather than setting off the EPIRB, she and her two male companions (one of whom was 70) were going to try to exit via Downies Hut the next day! Still on day 5 (which was meant to be an easy day after our long day yesterday!) we plugged on up the West Matakitaki. Due to my "interesting" choice of route up a wee gorge, it took us nearly 11 hours to get from E Matakitaki Hut to the cluster of three tarns at the head of the W Matakitaki, just below the pass itself. This was an OK, albeit slightly bleak, place to camp. The camping is somewhat better at the other side of the pass, just below the tarns where the streams starts to plummet, but we didn't have the energy to go looking for better camping. Day 6. From the 3-tarns, it's just a small scramble to the pass itself (which is a somewhat improbable notch in the ridge in line with the 3 tarns themselves). 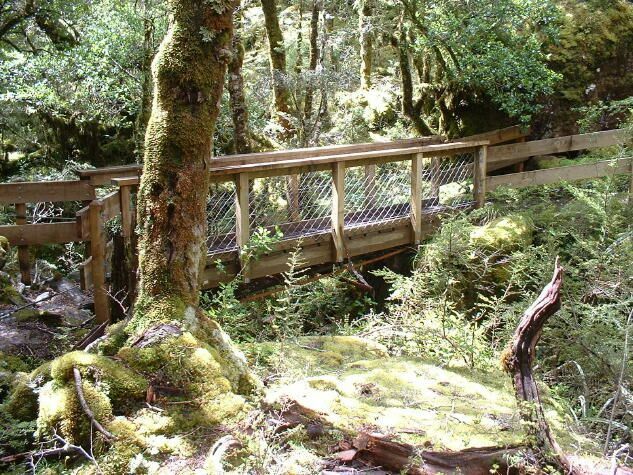 Then there's an easy descent to the Maruia Stream valley. The photo shows the view looking back up the Maruia Stream just as we started into the thick tussock. From there it's an easy tromp down to the St James walkway, though it's worth mentioning that you should stay on the true right, and there's a small bush bash before you come to the well-beated track that takes you the rest of the way to the walkway. 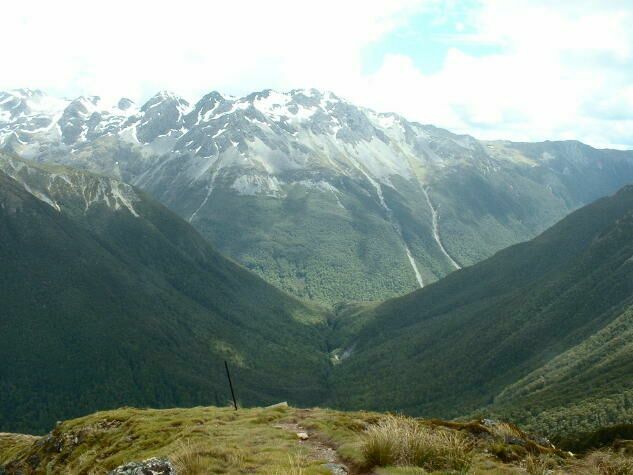 From the walkway I headed directly for Lewis Pass via Cannibal Gorge. Rebekah, with time to kill before meeting a friend, headed round the long way via Christopher and Anne Huts.